Ribes sativum is a shrub to 1.5 m tall, apparently extensively colonial, branches unarmed, young stems hairy, bark gray. Leaves alternate (no stipules), rounded in outline, 3-7 cm wide, often wider than long, 3-5 palmately lobed, base lobed, dark dull green above, paler, hairy below, margins blunt-toothed. Flowers greenish-brown, 5-parted, petals shorter than sepals, in unbranched, dangling, clusters (racemes). Fruit red, fleshy with dried flower remnant at base, many seeds Europe (Rehder 1986). 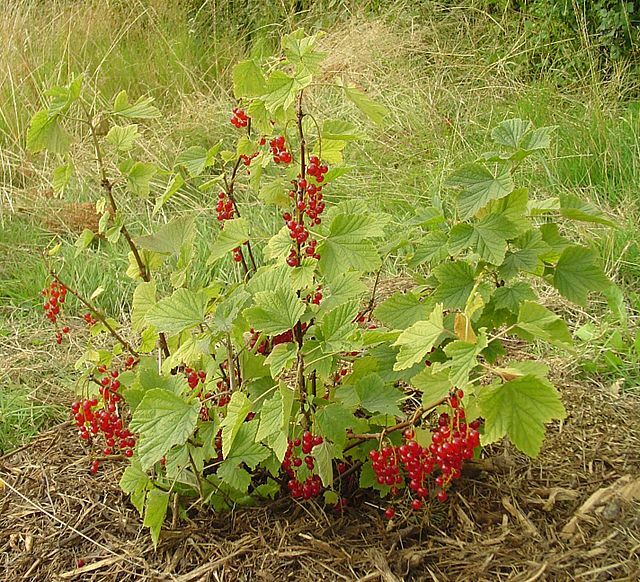 Ribes fruit is eaten and seeds dispersed by many birds and mammals (Martin et al. 1951). Notes: Attacked by the cluster-cup rust (Puccinia laricina) which causes yellow or orange spots on leaves and other parts. This rust uses sedges as overwintering hosts. Some species of Ribes act as alternate hosts to White pine blister rust (Cronartium ribicola), (Sinclair 1987).